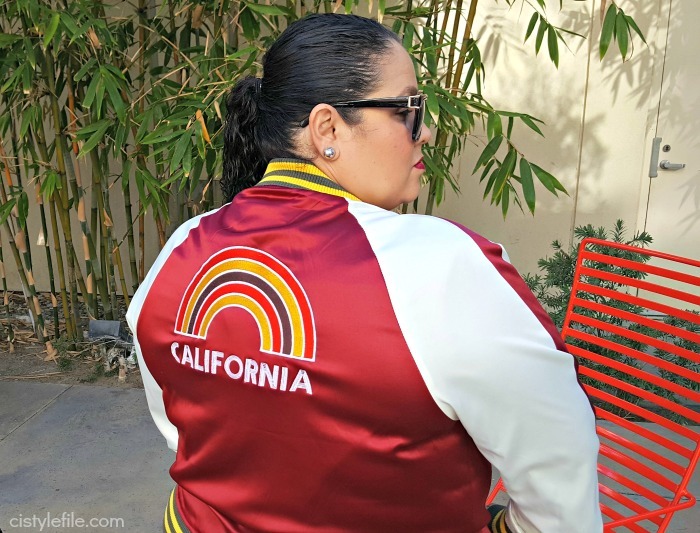 This our last Fab 40's collab post of the year, I am so grateful to have met more fashion bloggers over 40. I am very thankful to be able to collaborate with these awesome ladies every month. Hope to bring you more monthly Fab 40's post next year. So here is Decembers theme chosen by Jennie, Plaid. As she put it we are MAD for plaid this month. Being the holidays and winter time, plaid is a very appropriate theme. Plaid is a classic and we see variations of it every season. I my self have been wearing plaid since I was a child. I use to love plaid skirt in my teens, in college I wore more plaid shirts and currently I even have a pair of plaid pants. I really wanted to wear those plaid pants for this theme, but couldn't find them!! Then I found an awesome plaid dress online, when I went to the website to buy it....guess what! IT SOLD OUT! Ugh this theme should have been easy and I actually struggled a bit to come up with an outfit. As in the previous months Fab 40's challenges, I wanted to push my self and get out of my comfort zone with the outfit. After thinking about it a few days, I decide this month to go with what is most comfortable and true to my style. 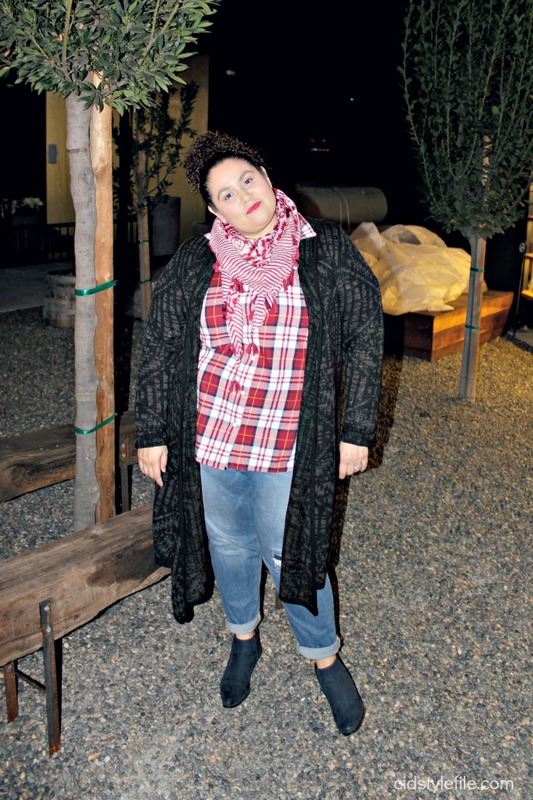 Plaid shirt and jeans is something I wear often, this is a outfit that represents my style. I wear variations of this outfit probably on a weekly basis. After looking in my closet I found about 6 plaid shirts. I didn't realized I owned that many. So going with a classic plaid shirt for this months Fab 40's theme was a no brainer. Plaid shirts for the win!! Since its actually been chilly and rainy in California lately, I wanted to stay warm. Wearing a big jacket didn't seem to go well with this outfit, it hid the plaid shirt which is the focus of my outfit. I decided to try it out with this long cardigan sweater. I got it from a black Friday sale at City Chic. Although the sweater has a print, it didn't clash with the plaid. Or maybe it does, but I like it either way. Distressed jeans are a staple in my wardrobe, I just love the way they look. Lately I have bought a few jeans from Old Navy which are pretty great. 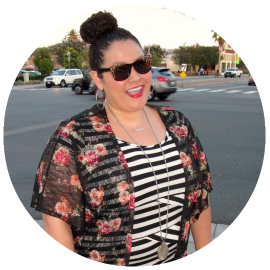 This outfit is 80% from Old Navy, which I didn't realize until I was writing this blog post. 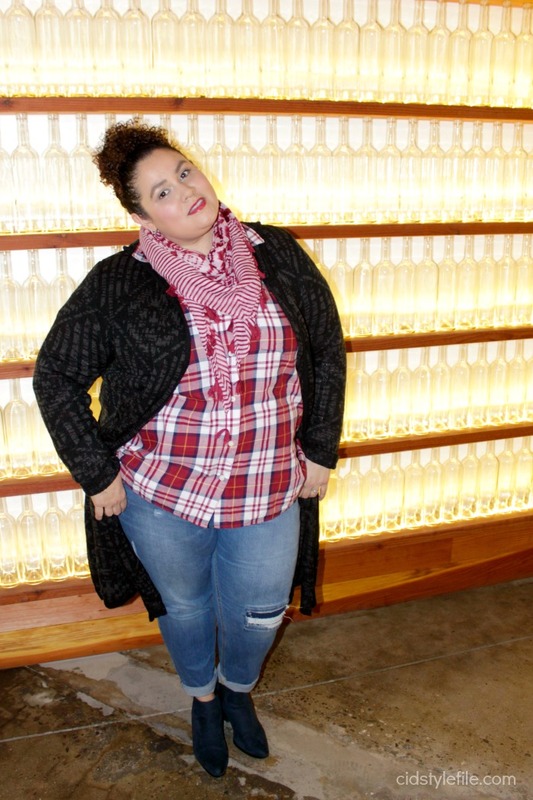 Plaid shirt, jeans and booties are all from Old Navy clearance section to be exact. I am addicted to bargain shopping and always check out the clearance rack first, before looking at rest of store. I usually find a some good items. Exhibit A: this entire outfit! LOL Even with the sweater it was still a bit chilly, since the day was windy I added the scarf. I found this scarf at Ross for only $4, I really love the color and tassels. Dark blue booties to compliment the blue in my plaid shirt and VIOLA! Here is my plaid outfit for the Fab 40's challenge. Its casual, comfy and just right for the holiday season filled with shopping, parties and spending time with family and friends. Hope you are enjoying the holidays and having a wonderful time with your own family and friends. Thank you for joining me on the blog each month with these Fab 40's post. These monthly post have been a ton of fun and I look forward to sharing them each month. 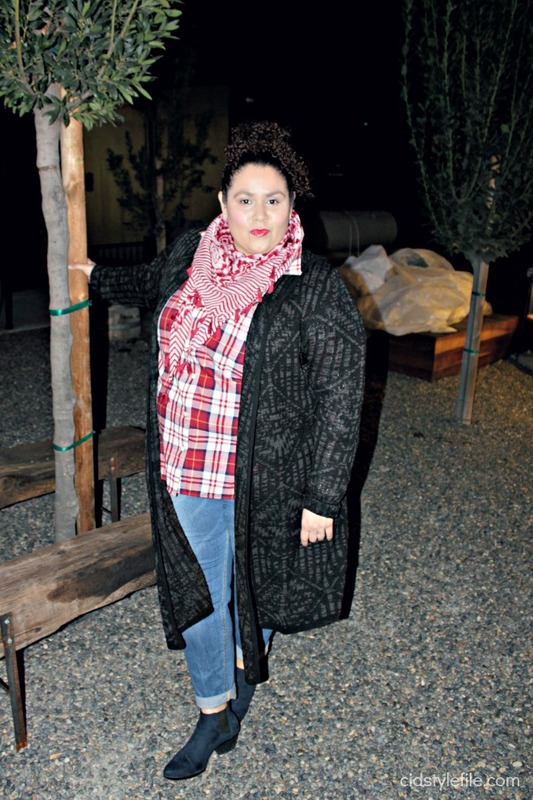 Jennie from A Pocketful of Polka Dots chose the plaid theme this month. She also went for a plaid shirt, and we share a love for Old Navy. Her shirt is from Old Navy too, but she totally made it look chic with the skirt and heels. 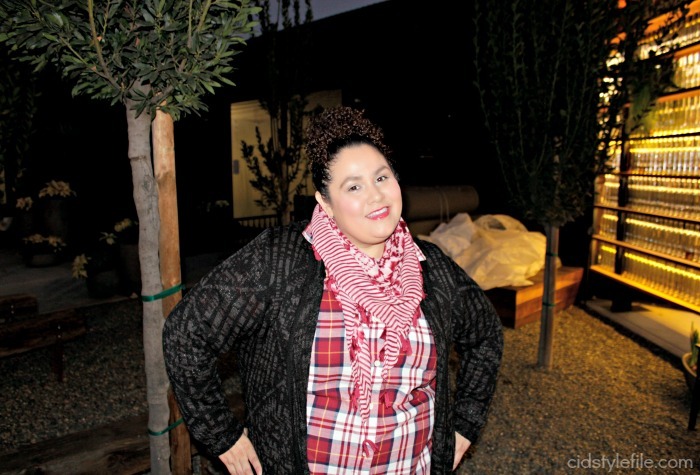 Mary from Curlybyrdie Chirps is just gorgeous and festive in her outfit. The color is just perfect for the season and totally on trend. Mary always adds feminine touches to her outfits and the pencil skirt is a perfect example. I love love the velvet mary jane shoes! Samantha from Fake Fabulous is Scottish for her plaid is tartan. Isn't it funny how we all use different words for the same thing. Although she said she cheated a bit and went with hounds-tooth instead of plaid. Well call it what you want, I still think her "plaid" look is pretty fab! Diane from Fashion On The 4th Floor, for some reason every time I see her outfits I want to call her Lady D! She always looks so elegant, classy and chic...Lady D suits her well. Kinda like her plaid suit, she looks so fierce in this outfit. 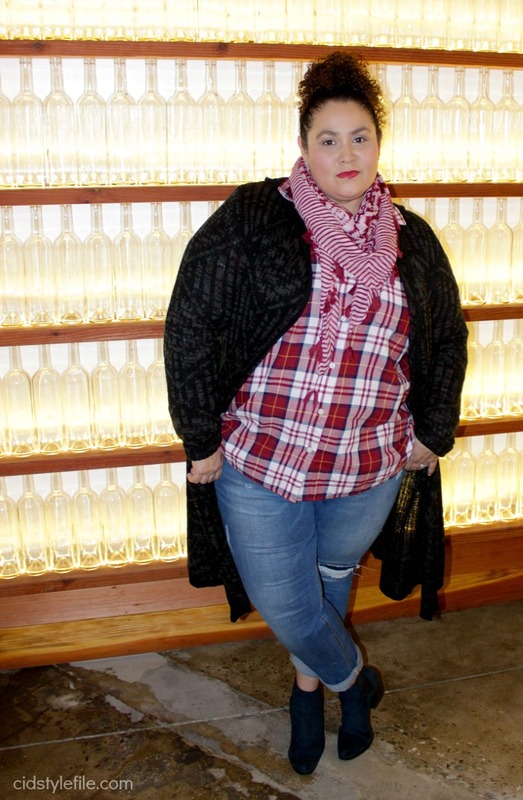 Anne from Kremb de la Kremb is totally festive in her double plaid look. That is mixing prints at its finest, I would have never thought to mix plaid with plaid. Bravo Anne, fabulous look fit for the holiday season. 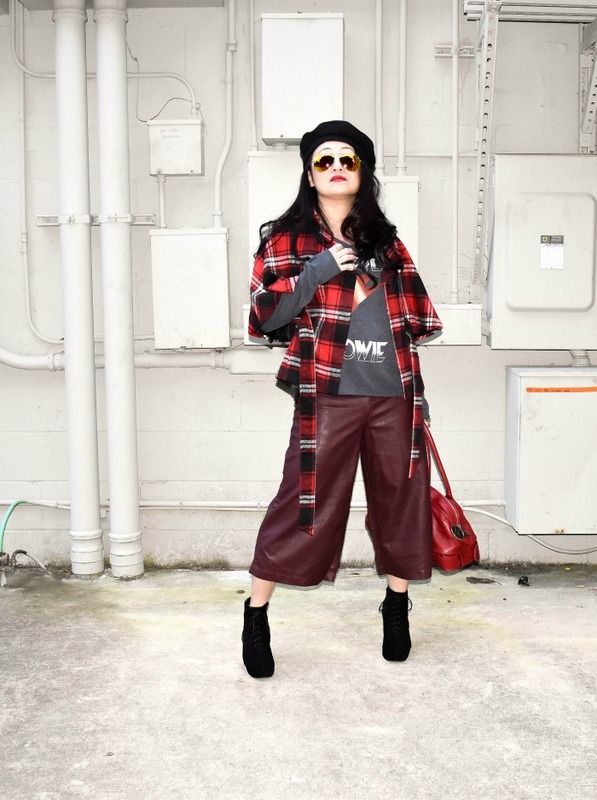 Sheela from Sheela Writes, can we all agree that she's the ultimate cool chick in this outfit! Every month Sheela amazes us with her outfits, and every month I want at least one piece from her wardrobe. This month I am drooling over her plaid cape, so freaking cool and tres chic!!!! 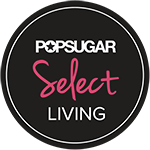 Meet Alison from Get Your Pretty On, she is this months guest blogger. She was invited by Jennie for this months plaid theme. Alison and Jennie seemed to be on the same fashion wave length, they both went with plaid shirts and leopard print accents. I like how Alison wore a sweater over her plaid shirt to just give us pops of plaid from underneath. Are you mad for plaid this season? 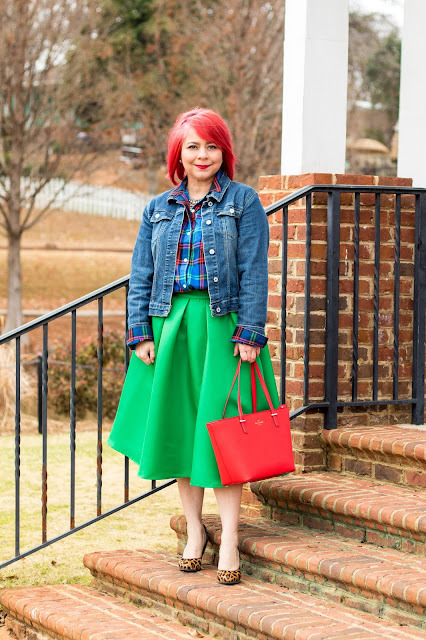 You must go to the all the Fab 40's ladies blogs to read about their plaid look inspiration. These ladies have inspired me so much and look forward to the style challenges each month. Give them all some blog love, click those links and get all the details on their looks for this month. I truly enjoyed reading how your look came together, Vero. I am glad you went with something that is totally you and I really enjoyed all of the pattern mixing. I must ask about the background - it is so cool. Also, I initially was going to go with a pair of plaid pants I have, too. :) Happy New Year, my fellow fab 40 fashionista! Jennie the background is from a place called Make just down the street from my place. It's a new spot that has a brewery and wine bar. I loved the wall of bottles and just had to use it as a back drop for my pictures. You look fabulous in plaid! These pictures are so much fun! I love seeing women my age looking great and enjoying fashion. Nice!!! I’m very happy to be here due to the fact this is a superb web page that offers lots of data about the topics blanketed extensive. I’m glad to see that humans are absolutely writing approximately this difficulty in one of this smart way, displaying us all exceptional aspects to it. Please keep it up. This is a decent post. This post give really quality data. I'm certainly likely to investigate it. Truly exceptionally valuable tips get here. much obliged for your requirements to this kind of extent. Continue the acts of kindness.